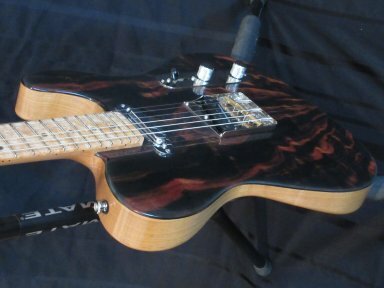 Macassar Ebony drop top Tele. Here is a truly one of a kind Tele. Finding book matched & flame Macassar Ebony to use as a Drop Top on an electric guitar is already rare. Finding spectacular wood for the rest of the components and putting it all together in this package knocks it out of the park. As if that wasn't far enough, this guitar employs a custom pickup wiring configuration that includes Vintage and Overwound pickup tones with 7 combinations. In all appearances, this Tele's switching looks very standard. However the first departure is the 4-way blade switch. This type of switch allows for an added tone selection placing the two pickups in Series wiring configuration, changing the electrical load and therefore the sound quality, giving more power and growl. The 4-way switch provides for pickup selection for; Neck / Both in parallel / Both in series / Bridge. Both pickups are Seymour Duncan "Hot for Tele" Bridge and Neck models. 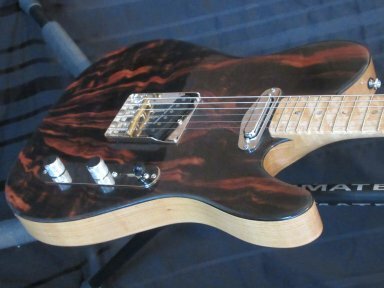 Further, the neck pickup is a Custom Shop Tapped model with Vintage and Overwound "Coil Tapping" options via a push/pull selector on the tone knob. This means that for each of the pickup selector switch settings that include the bridge pickup, there are two tone options (3 x 2) plus the neck, for a total of 7 tones out of a guitar with only 2 pickups! 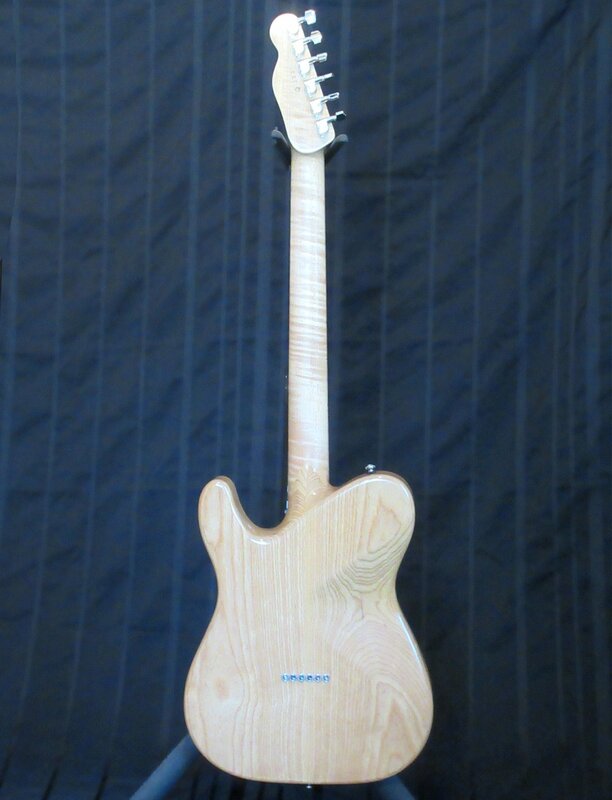 The traditional "Squawk" of the Tele is as much from the brass barrel saddles as from the pickups. 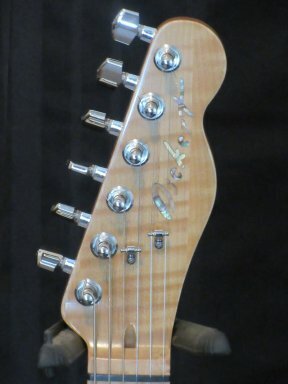 The problem with the vintage fender version as used for the last 60 years, is that the three saddles each have two strings passing over them, with no ability to set intonation for each string separately. The edge of the "ashtray" can also interfere with picking and strumming hand motion. This Joe Barden Tele bridge includes thicker plate steel, angled saddles set with pre-intonation, and a Danny Gatton-inspired “scoop” at the front of the treble sidewall clearing the way for your playing style. As said above, the top of the guitar is Macassar Ebony cut in such a way that the left matches the right sides (Mirrored), giving beautiful patterns of black and deep brown bands. 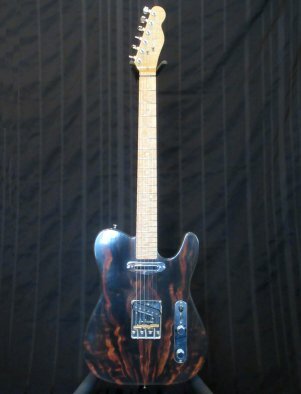 More outstanding is the shimmering "flame" figure in the grain reflection light in various ways as the guitar is moved. The Fret board is also spectacular with both flame and birds eye figure present in the Hard Maple. The premium wood selection caries on to the back of the guitar with an AAA grade flame Hard Maple neck, in addition to a very uniform grain and color totally solid White Ash body. Finally, adding to both sustain and playability is the carved set neck joint, with it's completely smooth transition to the shape of the body. 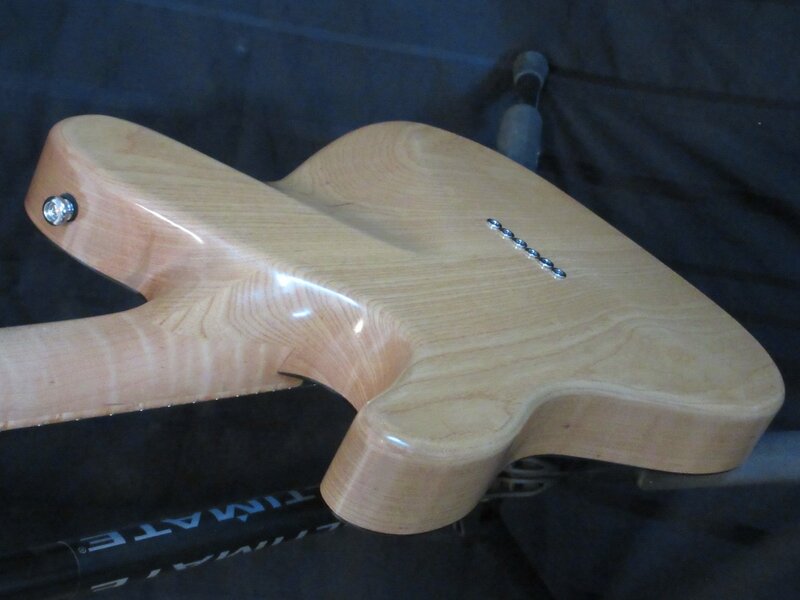 The contoured belly cutout also adds to the feel of this instrument.